Mikhail Saakashvili, re-elected as Georgia's president, said Monday that the vote demonstrates his ex-Soviet republic is on the road to becoming a European democracy. "I believe there are many aspects that need to be criticized, this is still a country in transition, this is still not a full-fledged, very well-formed, crystalized society, we still have lots of things to do," Saakashvili said in an interview with The Associated Press. "But I think we are on the right track and this election has just proven that." But the election, in which Saakashvili received 52.8 percent of the vote according to preliminary results, received a mixed evaluation from international observers who said it was overall in accordance with democratic standards, but showed an array of problems that need to be addressed urgently. Russia, which vies with the West for influence in Georgia, took a stronger stance, calling the election campaign "hardly free or fair." Saakashvili's opponents allege the election was widely rigged and say they will bring masses of protesters to the streets to press their objections. 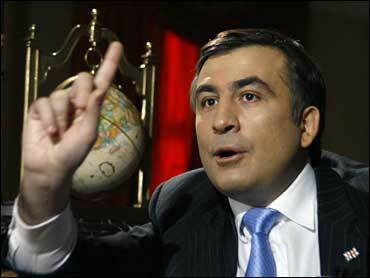 The U.S.-educated Saakashvili came to power after mass protests in 2003 over a fraud-plagued election. He has brought significant reforms to the country, but critics say his energy and determination have declined into authoritarianism. Saakashvili also said he was ready to work with the opposition, but said concerns over a deep split in society were exaggerated. "I would not exaggerate the idea of a deep split," Saakashvili said. "This election campaign went very well. In any normal European country, if somebody gets more than 50 percent outright in the first round, it is called a landslide and I don't see why Georgia should be otherwise." "With regard to the political process - yes, we need to be consensus builders, yes we need to agree on many things. We can never agree on some of the things, because that is how every democratic nation is." Asked about the opposition's plans to hold street protests, Saakashvili said that peaceful rallies are part of the democratic procedure. "That's fine. ... Everybody has the right to have peaceful rallies," he said. "I think unruly behavior will not be tolerated, but peaceful rallies are one of the ways to do political campaigns."